Toxic Scents are Serious Business! Video~Why are we eating poison? What Is Your Melanoma Risk? Cravings-why do we have them? Really -What are Whole Foods? There’s a world of difference between “Bite Size Pieces” and an ordinary cookbook. “Bite Size Pieces” is a very unique cookbook as the information offered is unsurpassed. In small digestible amounts, recipes, food choices and passion, is combined under one roof. You can live on “Bite Size Pieces”. 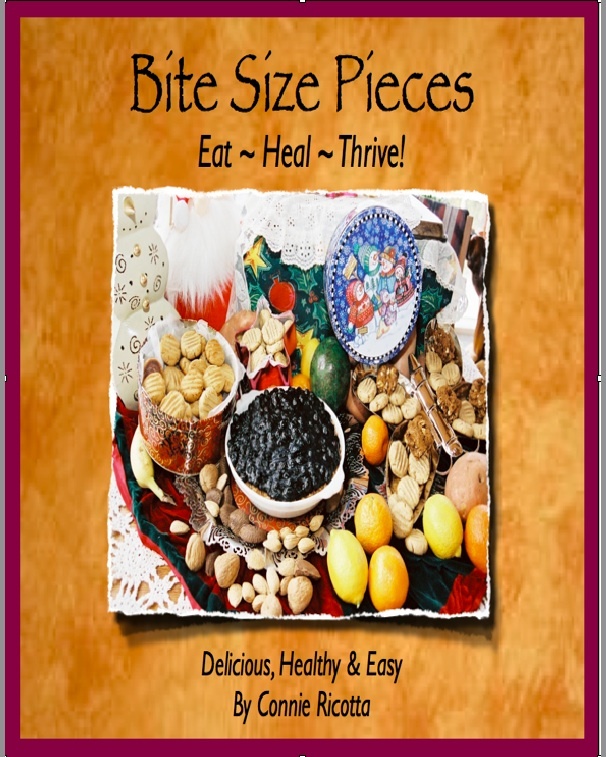 “Bite Size Pieces” is a great start, to knowing how and why to make changes and creating variety and color to meals that are satisfying and delicious. In “Bite Size Pieces” there are no mistakes-just masterpieces! After all, when we create a meal we are accomplishing the latest innovation. Don’t be afraid to get dirty. “Bite Size Pieces” brings the “fun” back in your kitchen! Connie is a Certified Health Coach, Culinary Artist and Reiki Master. Connie believes it is her purpose, and her passion to assist people in their journey to wholeness.